I don’t need to tell you that there are few “official” rules for trail riding, like there are for, say, driving. But there are some commonly accepted practices that I think are good to remind ourselves of every once in a while. And while the word “etiquette” implies good manners, trail etiquette is as much about safety as it is about courtesy. Horses are herd animals and prey animals and this is the driving force behind how they think. Most horses do not like to be “abandoned” and can get upset if they feel this is occurring. When they encounter something which they perceive as frightening, their natural prey animal reaction is to jump and run. Much of what is listed below comes from an understanding of these facts. Ideally hikers and bikers will yield to a rider. When encountering hikers or bikers, talk to them and get them to talk to you. Hikers with backpacks and bikers with helmets do not look human. Explain this to them and ask them to speak so that your horse will understand that this “thing” is actually just a person. Ask them to stand off on downhill side of the trail. Once again, horses are prey animals and often attacked from above, so keep the scary-looking thing down low. It can also be easier to control a horse going uphill if he spooks. Stay relaxed yourself and keep talking to the hiker and your horse if he is nervous. Find out if there are more in their party and tell them how many in your party. Thank them for their cooperation and be kind and courteous. We are all out there to enjoy ourselves. I think we all understand the problems that loose dogs can cause, so I will suffice it to say: if you can’t control your dog (100% of the time, with voice commands, and from horseback) or he is ill-mannered with other people or animals, leave him at home. In theory, single riders will yield to pack strings. Be prepared for this not to be the case (see item “3d"). In theory, downhill riders will yield to uphill riders. Be prepared for this not to be the case (see item “3d"). Do not try to squeeze by other horses, you are asking for all kinds of trouble. Instead, give yourself plenty of room to go around. I generally yield to anyone coming up or down the trail if I can because I know my animals and my riding ability. I don’t know their animals or their riding ability. So I take the safer route and yield myself. If it is a narrow trail with no way to move off to let another pass, decide who should turn around. Always turn your horse to the down hill side. He can see his front feet and won’t step off the trail. He cannot see his back feet or where he is putting them as well, so you want to keep those on the trail. Unless you know the oncoming horse and rider and their abilities, it is safest to assume that the horse and rider are both inexperienced and be prepared that anything could happen as you or they go by. 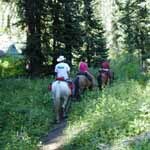 You want to maintain a distance of about one horse length between horses while going down the trail. This leaves you time and space to react safely in the event of an accident in front of you. When you encounter a short bridge on the trail, walk the horses across one at a time. Allow more than the usual single horse length between each horse over longer bridges. For your safety and the safety of others around you, pay attention to your horse and keep him under control. Keep a peripheral eye on the rest of the horses and the environment around you. Being prepared for anything to happen can often prevent a bad wreck. Think like a horse, especially if you are the leader of the group. If you look at objects on the trail like a prey animal (is it unfamiliar or potentially dangerous), you can help prepare yourself for anything. Once again preparation and awareness can be the difference between a controlled flight and a bad wreck. Nasty horses in the back. If your horse is unruly, he should bring up the rear where his poor behavior will not be witnessed by the other horses and cause them to get upset as well. And, if you are lucky, he may learn a thing or two from watching calmer horses in front of him all day. Tie a red ribbon in the tail of a horse that kicks. If you are following a horse with a red ribbon, obviously it would be safer to maintain a little more distance between you, but also you might be e extra watchful for signs of forewarning: pinned ears, swishing tail, hind leg at the ready, etc. Remember that your horse could move to avoid the kick and put you in its path instead. A broken leg or knee from a kick 10 steep miles from the trailer is no fun. Mares in season and stallions can present special problems on the trail. They require an extra level of attention on the part of the rider and the others in the group. If you are riding one, be extra vigilant of her/his behavior. If you are not, but they are part of your group, keep an extra eye out on these animals. Ideally the rider on either of these animals would be an experienced horseman, but we all know you can’t count on that. Warn oncoming riders if necessary. And then also consider that any horse you may pass on the trail could be a mare in season or a stallion and that the rider may not be experienced. Watch the footing, especially on uphills and downhills. Gravel on rocks is like ice. Wet bridges can also be very slippery. If you encounter problems, warn any riders behind you. Take turns leading, if possible…share the dust. When you reach a watering area, take turns and don’t crowd. Wait for everyone to finish before moving off. And remember your Leave No Trace ethics: do not destroy additional water front so you can all water at the same time. Use only the obvious area where animals come down to drink. Stop if there is a wreck. This should be pretty obvious. Your help may be needed. But also, once again, horses are herd animals and do not like to be left alone, especially in an unfamiliar area. If you ride off, while someone is trying to mount back up, their horse could panic and take off to catch up with the group. Try not to walk through soft, wet ground. Horses’ hooves are sharp and destroy vegetation. Pick up all your trash, including cigarette butts, and pack it out. Pick up other people’s trash to keep places as pristine as possible and set a good example. Be respectful of those who live there and those who will visit behind you. Always be prepared for the idiot or the inconsiderate bloke. Be prepared for someone to take off at a gallop while you are mounting, bump into you from behind or stop dead in front of you. Keep your comments to yourself (or pick your battles). Unless the situation is a health risk or puts a life in danger, refrain from passing on your horsemanship wisdom. Many people may not respond well to a “know-it-all” or will resent the implication that they are stupid. Your “helpful suggestions” may cause more harm than good. Always carry ID on your person and on your horse in case you become separated. Tell someone where you are going in case you don’t come home, even when riding with a group. Carry basic survival gear on your horse and at least the bare minimum on your person: cell phone, matches, food, water. Following basic trail etiquette can help ensure the safety of you, your horse safe and others who you ride with or meet on the trail. But just as importantly, it can keep the trails open to horses. Many trails are closed to horses because of riders who abused the privilege. It is a privilege as much as your right to ride these trails. Remember that you are always an ambassador of horseback riding and that we all share the outdoors. If non-riders always meet a courteous and polite horseman on the trail, their impression of all of us will hopefully remain positive.